To avail, simply select your booster/s of choice at our Registration Form. → Orig price: ₱395 +100 shipping fee. 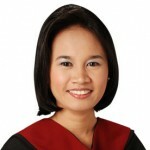 Save Php 100! Applicable to Philippine addresses only. 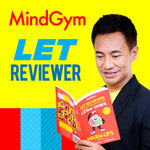 The only LET review book which contains a complete package of vital information one needs to pass/TOP the LET: what to review, how to review, warm up drills (150 general, 150 professional education items, 10 Specialization), study and test-taking strategies and tips from our LET topnotchers. A great starter or companion in one’s LET journey. Read testimonials here. 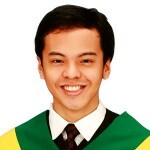 → Orig fee is Php 3,000. 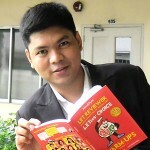 Save Php 1,500! Participating in MindGym’s live LET Specialization coaching weekend will give you valuable insights on the latest LET trends and tips for your major. 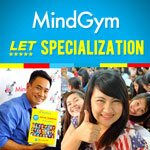 Specialization review classes are small group meetings facilitated by MindGym topnotchers and high-raters who excelled in their respective LET majors. Depending on your specialization, coaching may take from two to three days. Joining our Specialization review gives you an extra edge when it comes to 40% of the LET (for Secondary Level LET-takers). A big help to those who have college courses which did not cover the entirety of LET proficiencies to be tested for their assigned Specialization; to those who are self reviewing or attending other LET review centers; or online reviewees who want more intensive coaching in their specialization. Scheduled two weeks prior to the LET. 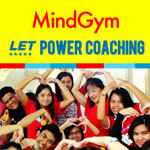 A big group gathering of MindGym’s live and online LETers. Your last shot at boosting your confidence in passing/TOPping the LET. On the first day, experience a mock exam which will help you avoid hassles and blunders in filling out LET forms, ensure that you complete the LET within the time allotted, and give you time to build up your stamina and endurance for a whole day test. On the second and third days, expect power refreshers and learning folios, extra drills, testimonials and sharings from topnotchers and specially-challenged MindGym reviewees-passers, warm bonding times with fellow LET-takers, and memorable commencement activities. This package covers the event fee, activities, prizes, and of course, LET review materials and drills.